Now it is time to start to tie it all together! I have used a mixture of Sap Green and Quinicridone Gold to glaze over some areas of the water. Near the foreground left, I used Olive Green and VanDyke Brown and Permanent Alizarin Crimson in the foreground right. 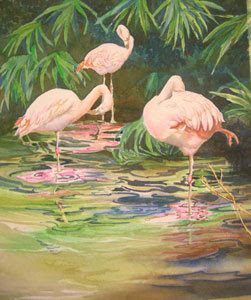 I used some of the Quin Gold on the orange areas of the flamingos, as well as on the branches on the right. I used a very wet mixture of Olive Green and Quin Gold to glaze over the leaves and the entire background. I want to be sure they aren’t too detailed and compete with my true focal point.